This article is about an island in Ontario, Canada. For the island in Nunavut, see Amherst Island (Nunavut). Amherst Island is located in Lake Ontario, 10 kilometres (6 mi) west of Kingston, Ontario, Canada. Contrary to popular perception, Amherst Island is not one of the Thousand Islands. The island is part of Loyalist Township in Lennox and Addington County. Amherst Island is located about 3 kilometres (2 mi) offshore from the rest of Loyalist Township and is serviced by an automobile and truck ferry from Millhaven. The island measures over 20 kilometres (12 mi) in length from Bluff Point in the southwest to Amherst Bar in the northeast and over 7 kilometres (4.3 mi) at its widest point across. The island is about 70 square kilometres (27 sq mi) in size and is one of the largest islands in the Great Lakes. The Amherst Island archipelago also includes: Nut Island, Grape Island and the Brother Islands. These small islands cover over 6,695 hectares (16,543 acres) or about 66 square kilometres (25 sq mi). Nut Island is the largest of the islands that immediately surround Amherst Island and is about 610 metres (2,000 ft) off the Amherst Island coast between Amherst Bay and Long Point Bay. Grape Island is located about 300 metres (1,000 ft) off the Amherst Island coast, and can be easily seen from shore. The Brother Islands are situated between Amherst Island and the Lemoine Point Conservation Area in Kingston, Ontario. Amherst Island was originally inhabited by Indigenous peoples who gave it the name Kaounesgo. Amherst Island was known by the French as Isle Tonti, after Henri de Tonty, who accompanied La Salle during his explorations. The island was later settled by United Empire Loyalists. 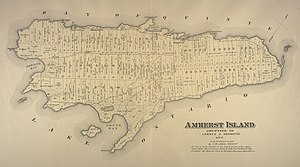 In a proclamation by the Lieutenant Governor of Upper Canada John Graves Simcoe on 16 July 1792, the island was renamed from Isle Tonti to Amherst Island, in honour of Jeffery Amherst, 1st Baron Amherst, who was commander-in-chief of British forces in North America. 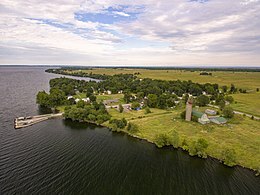 At the same time, he named the archipelago for the victorious Generals at the Battle of the Plains of Abraham: Wolfe Island, this one, Howe Island, Carleton Island and Gage Island. The last is now known as Simcoe Island. In 1788, the island was granted by the Crown to Sir John Johnson, who had lost most of his possessions in the War of Independence. In 1823, Sir John's daughter, Catharine Maria Bowes, gained control of the island and legend is that she later lost it in a card game in Ireland. What can be documented is that in 1827 Mrs. Bowes was in financial trouble and gave a power of attorney to the Stephen Moore, 3rd Earl Mount Cashell, who purchased the island from her in 1835. Mount Cashell's interest in Amherst Island was both profit-oriented and humanitarian. Financially, he hoped to reap large returns on his investment by settling the island with industrious immigrants who would clear and cultivate the land, thereby improving its value and providing him with a steady rental income. But his vision extended beyond pecuniary ends. Inspired by the evangelical belief in human improvement, he thought that by encouraging emigration from Ireland to Canada he could help solve the overpopulation of his homeland, create a prosperous, loyal farming population in the new world, and strengthen the Empire through a transatlantic grain trade. Mount Cashell became a leading spokesman of these views in North America. Mount Cashell brought settlers out from Ireland giving them seven-year leases at a nominal rent and requiring them to make certain improvements each year. He financed the establishment of a general store, maintained the church and glebe, provided the resident land agent with a home, and divided the island up into individual farms with a large section reserved for timber. Families from the barony of Ards, Co. Down, began arriving in the 1820s. Throughout the 1830s and 1840s their numbers swelled as friends and relatives continued to arrive, but by the 1860s the movement had subsided. Why they happened to be from the Ards, property not owned by Mount Cashell, is unclear. Settlers who arrived in the early years moved straight onto the land while those arriving after 1850 seem to have worked for friends before renting land. By 1841, the community had three schools and a population of over 1,000 people. The majority of families were Presbyterian, 5-6 were Church of England, 10-12 were Roman Catholics and only a few were Methodist. Most settlers lived in shanties or one-storey log houses on the rented land, although some had purchased their property from Mount Cashell. While Amherst Islanders prospered from the grain trade in the 1840s, their landlord fell upon hard times. The famine in Ireland hurt Mount Cashell badly. Distressed Irish tenants and declining rents placed a heavy burden on a landlord who was already in debt because of lavish living and beleaguered by an untrustworthy agent's embezzlement. In 1848, he mortgaged Amherst Island. Several more mortgages followed on his Canadian properties, and in 1856 his creditors foreclosed and Amherst Island was sold at public auction for much less than its market value to Robert Perceval-Maxwell (1813-1905). Some of the current residents of the island are descendants of those early settlers. Amherst Island at mid-19th century was a mixed economy of farming wheat and barley, fishing in the Bay of Quinte, sailing the Great Lakes, and shipbuilding at the local yard of David Tait. Soon, however, the shipyard closed when local forests were depleted; sailing declined as railways won out over water transport; and crop farming gave way to more stable, mixed dairy farming. As the economy changed those who could not make the transition left, and those who remained behind managed to purchase and expand their farms. In all this, R.P. Maxwell and his agent were the primary financiers, establishing the agricultural society and a cheese factory, promoting improvements, and financing loans and mortgages. Throughout these years, the Ards emigrants did very well. Many became proprietors, they held prominent positions in the community, and the Island became well known for its 'Irishness'. John Watson, from Portaferry, called his pub on the Island the 'County Down Inn'. The stone fences that lined the land were modelled after those on the Ards. The Frontenac II, a passenger and vehicle ferry servicing Amherst Island on Lake Ontario in the community of Loyalist Township, Ontario. The two main communities on Amherst Island are Stella and Emerald. Stella is the major hamlet, where the ferry docks are, and lends its name also as the postal outlet name for the island. Emerald is a collection of four houses and a church towards the west end of the island. The island is accessible from the mainland only by water or air. A toll ferry service, carrying cars and people, connects the hamlet of Stella on the island with Millhaven on the mainland. The ferry, M/V Frontenac II, runs 365 days a year, with a crossing time of about 20 minutes. There is a nominal charge for bicycles and motorcycles while walk-on passengers are free. The ferry service is run by Loyalist Township. The resident population of about 450 people doubles during the summer months. The Amherst Island Public School doubles as a community centre for Amherst Island outside regular school hours. The Ministry of Transportation has awarded a $51.7 million contract for the conversion of the existing ferry docks from side-loading ramps to end-loading ramps to allow for easier access to and from the Island. Construction is expected to take place during 2017/18 and will include improved vehicle queuing areas, public restrooms and heated waiting areas. MTO has further announced plans to construct a new $20 million ferry for Amherst Island to replace the M/V Frontenac II near the end of 2019. A volunteer community radio station, Amherst Island Radio CJAI, began broadcasting on April 1, 2006, originally on 93.7 FM. Previously licensed as a developmental community radio station, CJAI changed frequency to 92.1 FM in October 2007 following the licensing of a new radio station on the adjacent 93.5 frequency in Kingston, and was granted a permanent license on December 6, 2007. It now operates as a 250-watt class B community broadcast undertaking. It is a 100% volunteer operated station, and is concerned with the preservation of the Amherst Island way of life, accurate and timely information reporting, and the promotion of Canadian musical talent. Native islanders include Harry Raymond Fleming (1892–1942), Canadian MP for Humboldt, Saskatchewan, and English-born artist Daniel Fowler (1810–94), who immigrated to Amherst Island in 1843 and remained there until his death. Fowler stated in his autobiography: "I found a sufficient variety of subjects on the island, along with shore and inland, and never went away on any sketching trip." Inspired by the Island's bucolic landscape, flora and fauna, Daniel Fowler was considered by his peers as "one of the fathers of Canadian Art". The house he lived in during his final years still exists on the north shore of the Island. A plaque commemorates the site. Amherst Island is internationally recognized for concentrations of wintering hawks and owls and is home to the famous Owl Woods nature reserve. Up to 10 species of owls have been recorded during a single winter. short-eared owls, long-eared owls and great horned owls are among the resident bird population. Visitors from the far and near north - snowy owls, saw-whet owls, and the rare boreal owl as well as eastern screech owls and barred owls – add to the owl population during late fall and winter. Both red-tailed hawks and rough-legged hawks are usually present, and there are annual sightings of bald eagles, peregrine falcons and turkey vultures. Amherst Island is internationally known as an Important Bird Area and a key migratory location for birds; this fact has caused some concern for those wary of the proposed industrial wind turbine project slated to be built on the island. The island is noted for farming, particularly of sheep of which there are several thousand on the island. The island's roads, built long ago, have little automobile traffic making the island an excellent locale for cycling, especially on the gravel and dirt roads that hug the shores of Lake Ontario. The island has warm moderate summers, cold brisk winters and steady lake winds most of the year. "Islands of Life", a report published in 2010 by the Nature Conservancy of Canada, ranks Amherst Island second in biodiversity significance among the islands of northeast Lake Ontario; second only in significance to its larger neighbour, Wolfe Island. Amherst Island is listed in the 100 Nature Hot Spots in Ontario, a book released in 2016, written by Chris Earley and Tracy C. Read. The Dry Stone Walling Association of Canada (aka Dry Stone Canada) believes that Amherst Island contains the largest known concentration of historic Irish dry stone walls in Canada. Many of the walls are considered to be at least 170 years old or older. Steady lake winds, especially in winter, make some people believe that the island is an ideal potential location for wind turbines. Several companies have expressed interest in developing industrial wind turbine projects on the island. After initial assessment two firms have withdrawn; one is still pursuing this action, encouraged by residents who have signed leases for wind farm turbines to be sited on their lands. Some island residents are opposed to the project, raising concerns that the proposed twenty-six 51-storey wind turbines will have a negative impact on the rich natural and cultural heritage and on tourism, both on the island and in local mainland communities, as well as on migratory bird, bat and Blanding's Turtle populations. Several groups of residents have formed as a result of the proposals. The island landowners who have agreed to host turbines on their land have formed Citizens of Amherst Island for Renewable Energy (CAIRE). Those opposed to wind power development on the island have formed the Association to Protect Amherst Island (APAI) and a coordinated sister group, SaveAI. In January 2012, the Ontario Federation of Agriculture asked the Ontario government to put a moratorium on all wind turbine projects until the health effects of this project and other issues have been properly assessed. In 2011 Senator Bob Runciman championed a motion which resulted in a unanimous vote for a moratorium on wind-farm development along eastern Lake Ontario until the impact on birds and bats can be studied. Such a moratorium would protect Important Bird Areas and the migratory flyways - Prince Edward County and Amherst Island were featured. No action was taken by either the Federal government or the Liberal Provincial government. In 2013 Amherst Island was voted one of Canada's Top Ten Endangered Places by the National Heritage Trust because of the threat of wind turbines to the cultural and natural heritage of this Island. The Trust continues to monitor the situation. In September 2015, Windlectric Inc., a power generation company based in Oakville, Ontario, agreed to invest CAD272.5 million (USD181.33 million) in the construction and development of Amherst island wind energy project. The total installed capacity will be 74.3 MW, from 26 wind turbine generators. The wind turbines were expected to commence commercial operations in fourth quarter of 2016 or first quarter of 2017 but actually became operational in early 2018. ^ White, James (1910) Place-Names in the Thousand Islands. Government Printing Bureau. ^ a b c d e f g proni.gov.uk: "INTRODUCTION - Perceval Maxwell Papers"
^ Mrs. James Hawkins. "History of Wolfe Island". ^ "Amherst Island Ferry". Loyalist Township. Archived from the original on June 27, 2014. Retrieved April 20, 2013. ^ "Amherst Island Ferry Service". Amherst Island. Retrieved April 20, 2013. ^ "Amherst Island Public School". Community Information Centre of Ottawa. Retrieved April 20, 2013. ^ "Ontario Improving Ferry Connections to Amherst Island". news.ontario.ca. Retrieved 2017-01-29. ^ "Ontario Building New Amherst Island Ferry". news.ontario.ca. Retrieved 2017-01-29. ^ "Islands of Life: A Biodiversity and Conservation Atlas of the Great Lakes Islands" (PDF). Nature Conservancy of Canada. p. 143. Archived from the original (PDF) on 2012-07-29. ^ Schram, Alena (March 28, 2013). "Turbine foes left to twist in the wind". Financial Post. Archived from the original on May 3, 2013. ^ Blackwell, Richard (January 20, 2012). "Ontario farm group calls for halt to wind power development". The Globe and Mail. ^ "Windlectric to Invest USD181.3 Million in Amherst Island Wind Energy Project in Ontario, Canada". Progressive Digital Media - Deals. Retrieved September 7, 2015. Wikimedia Commons has media related to Amherst Island.